What is a better way to get into the creative process than to get away from all the drama of daily life by going on a vacation! Where to Eat? 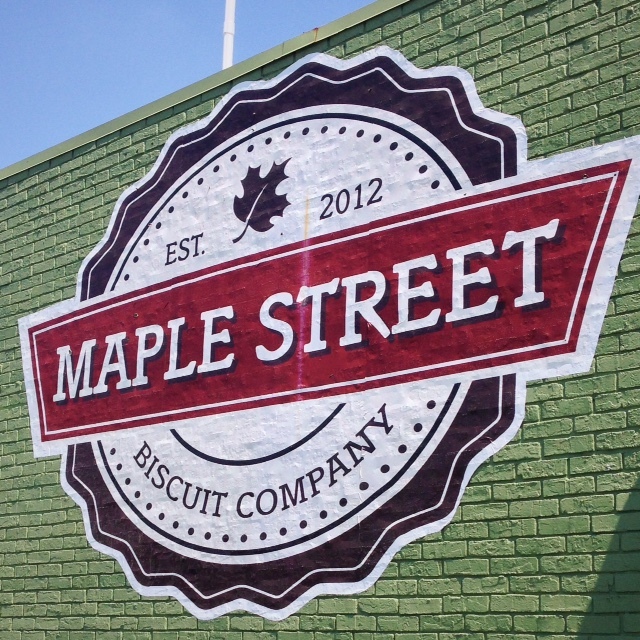 Check out my blog posts on Two Dudes and The Maple House Biscuit Company (also listed below). What to do? If you are in the mood for some great theatre, check out my post on Players by the Sea. I’ll be returning to Jacksonville Beach January 2016 to see one of my amazing playwright friend’s original stage production of Cotton Alley so my posts on Jacksonville Beach will grow. Plus I still have two restaurant reviews I need to post on The Seafood Kitchen and The Fish Company. I wanted to discuss my book idea with my trusted writing friend Olivia. I knew she would have some good insight and plus she lives on the beach. Sweet. 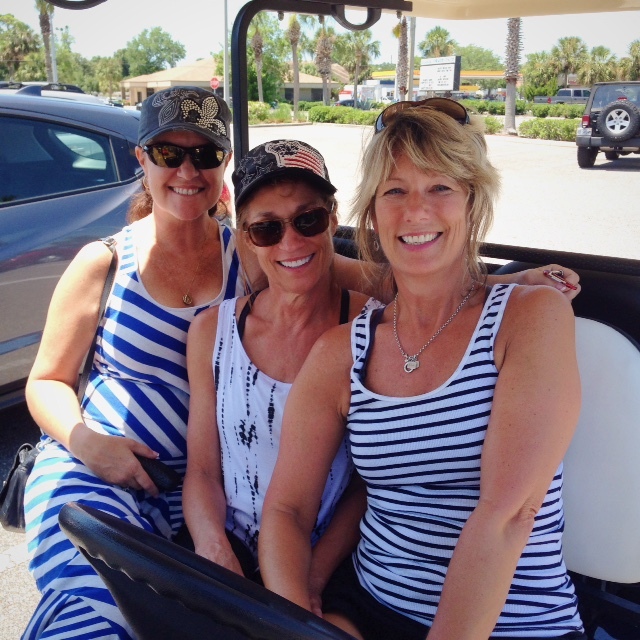 I had traveled to Jacksonville Beach back in high school with my sister, her son and my father for summer vacation. I just remember we had a blast with simple good family time. We went to the beach, went into Jacksonville for some shopping and we ate some great food. I have no idea where we went, but the place we went to had amazing lobster and, even though I was stuffed, the peach cobbler was so good I had to eat it. I will say that Jacksonville and Jacksonville Beach are different. You go over this little bridge and boom, you’re in a beach community. Courtney, a waitress at The Fish Company, said it best, “It’s a little beach and everyone knows each other”. Maybe that is why everyone was so darn nice. I’m not exaggerating, everywhere I went someone talked to me and when they found out I was visiting they freely gave conversation and suggestions on places to visit. 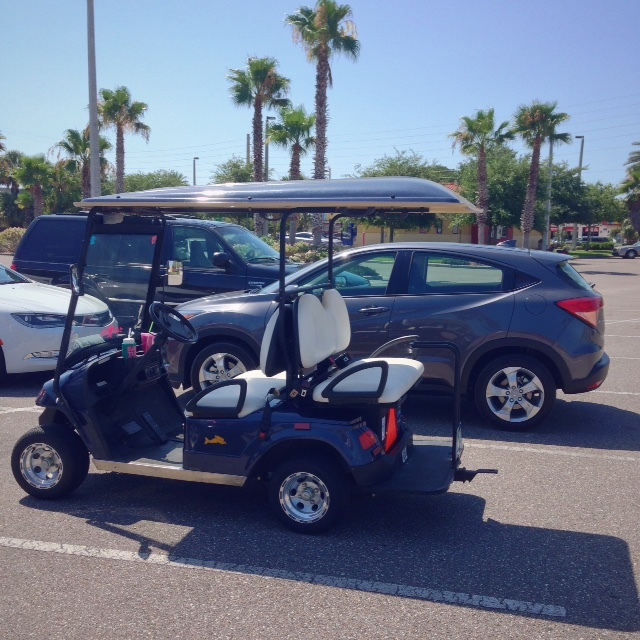 While visiting my last stop in Jacksonville Beach for lunch, The Fish Company, I parked my new Honda HR-V next to the coolest ride in the parking lot, a golf cart decorated mermaid reflectors and a sticker that said Kickin It in Golf Cart. Luckily, I met the fun ladies responsible for this amazing ride on the way out of the restaurant: Susan, Debbie and Jamie. What a hoot! I will need to come back and add more about Jacksonville Beach soon and I promise I will. One of the people I met at Two Dudes warned me about falling in love with Jacksonville Beach and now I see what he meant. It’s been over a week since my visit and I keep thinking about the beach, Olivia, the amazing seafood, Players by the Sea and just the sense of community there. I had been reading reviews online for my first dinner out in Jacksonville Beach and of course it had to be seafood. I wanted lobster and grilled fish. I had narrowed my choices between The Fish Company and Two Dudes, which were both located extremely close to each other. On my way out of the hotel, I asked the concierge where would be the best place for fresh fish and she gave me a card for The Fish Company which included a 10% off incentive. But for whatever reason, I decided to go with Two Dudes. 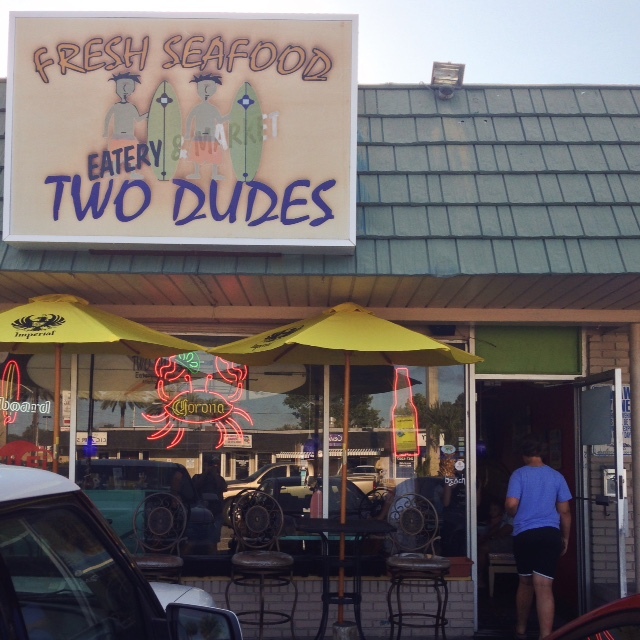 Two Dudes is located just off Atlantic Avenue in a tiny strip mall. From the outside it looks like a dive and to be honest it kinda is. Parking is minimal, but I was lucky enough to find a place right in front. Once I got inside I realized why I was able to find parking. The AC was out, but this small restaurant was still fairly full. It was exactly what I was looking for except for the heat. Since I was going to be attending a play at the Beach Side Players right after, I wasn’t sure I would be able to stay since I didn’t want to sweat through my shirt. Then I heard one of the owners (I was guessing) say that the air was only working on one side of the restaurant to a couple as he moved to seat them. I got up and followed them into a smaller room that only had three tables in it. I occupied the table closest to the wall and closest to the AC. I was now ready to check out the menu. I was greeted by Boggsie (or so it said on the printed bill). This young lady was just cool. She had a great vibe and she seemed to know everything about the menu in an easy and conversational way. The fresh selection is written daily on their chalkboard, but since I couldn’t see it she ran down the list for me. She recommended the Corvina fish blackened. I had never heard of this fish before and Boggsie describe it as a higher grade red snapper. I love red snapper so I went with her suggestion. I also ordered upon her recommendation their wasabi slaw and their panko breaded fried corn. The meal was amazing. The fish was cooked perfectly with a nice blackening that was spicy but still allowed me to enjoy the flavor of the fish. The portion was huge, which looked like I got a portion and a half. The two pieces of corn were golden brown, creatively sinful and delicious. The wasabi slaw was good, but in my opinion needed a bit more salt. The dish I ordered came with two sauces: the homemade tartar sauce and a pink sauce (I’m guessing some kind of remoulade). Their tartar sauce was slightly lemony, but still I found it lacking. The pink sauce was much better and I added it to my coleslaw. To be honest, that fish was so good it needed need tartar sauce. It would be a sin to mask this fish in any way. Dramatic? Maybe, but if I lived in Jacksonville I would eat there every week. I was blown away that he price for my meal, tea, and tax was under $27 dollars. I knew that it would be hard to find a place that could beat the food and the wait staff at Two Dudes and after visiting other establishments in the Jacksonville area, I found I was right. This place is my number 1 pick for casual dining and amazing food. While I was there, the couple in front of my started a conversation with me, asking if I was also attending the concert they were attending, but I wasn’t. I explained I was from Georgia here to see one of my dear college friends in her performance of August of Osage County. The man was actually from Georgia but had visited Jacksonville and had flew in love with the place and decided to move there. He actually warned me about falling in love with the place. Since I was from out of town, the lady told me I should go to The Maple House for breakfast. I type the name into my phone. She said that I would get a biscuit, a piece of fried chicken and to get it with the pepper jelly. I love suggestions. We continued our conversation until it was time for both of us to go to our designated entertainment for the evening. I would find out that for whatever reason people in Jacksonville were just like that, nice and easy to talk to. Breakfast: My favorite meal of the day! I was excited when Olivia voiced she wanted more than just coffee and a muffin for breakfast. I told her about the suggestion the lady before I had made to me about Maple Street. Olivia seemed to jump with excitement and we were off for some biscuits, which was less than a minute away. 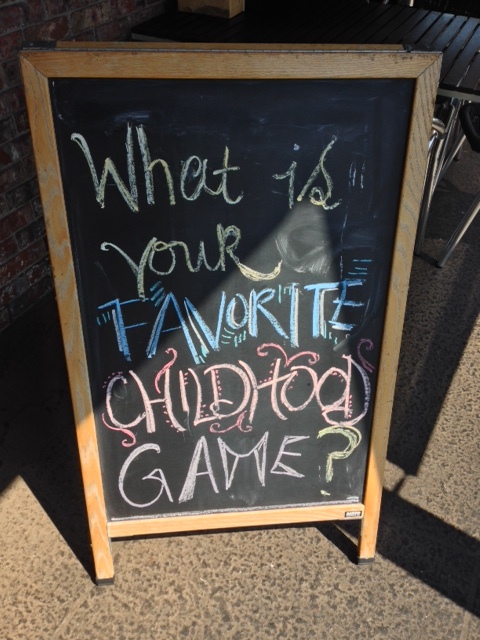 It was a nice brick building but what got me even more excited was a sign outside the main door that asked, “What’s your favorite childhood game?” I noticed you order at a walk-up counter and they call not your name, but by the name of the game you give them. The game I chose was Eeny, meeny, miny, Moe. Yeah I’m cool. My first choice was spin-the-bottle, but I decided to be a good boy. Sainthood. The dining room was large and modern. I loved how open and l loved the natural light. The menu was listed on big boards along the wall, but the line was so long that one of the staff started passing out paper menus. I found the suggestion the lady from Two Dudes made, but I couldn’t get past the first item on the menu, The Five. 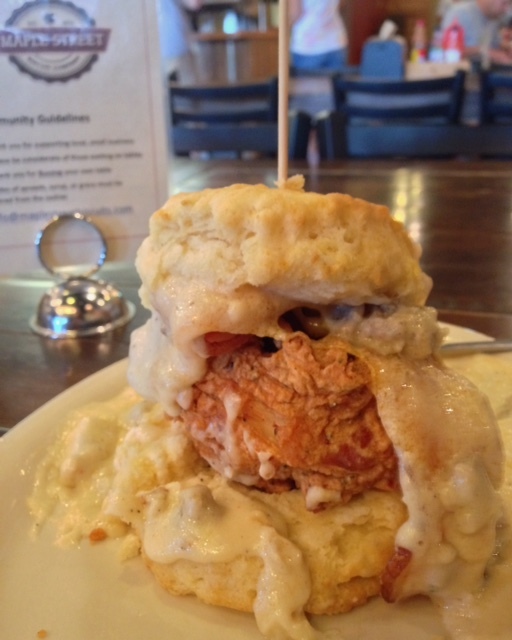 Here is the description for The Five: Flaky biscuit, all natural fried chicken breast, pecan wood smoked bacon, cheddar cheese topped with sausage gravy with a little kick. WHAT? Whose hungry now? I felt kinda bad for Olivia because she went with the suggestion that the lady from Two Dudes gave, Squawk on the Street, which was good, but it was kinda like sweet and sour chicken on a biscuit. So maybe save that for closer to brunch. I did let her try mine, but regardless, if you have a Maple House near you, Florida and one in Tennessee, you must check it out. This will be my go to breakfast place when I re-visit Jacksonville again in January when I go to see Olivia’s original play. I ordered “The Five” and I fell in love.